WALK WITH THE SQUIRRELS AND FLY WITH THE BIRDS! Guided by professional interpreters, the Eco Tour promises exercise, adventure and education. Venture across southern Ontario’s longest 420 ft. Suspension Bridge, and view the panoramic geography of Georgian Bay and countryside from the highest point of the Niagara Escarpment. Treetop walk along gently swaying 10” wide airborne walkways, over six hundred meters linking eighteen trees. At heights of up to sixty meters above the forest floor, learn about the plant and animal ecosystems particular to this UNESCO designated biosphere reserve. 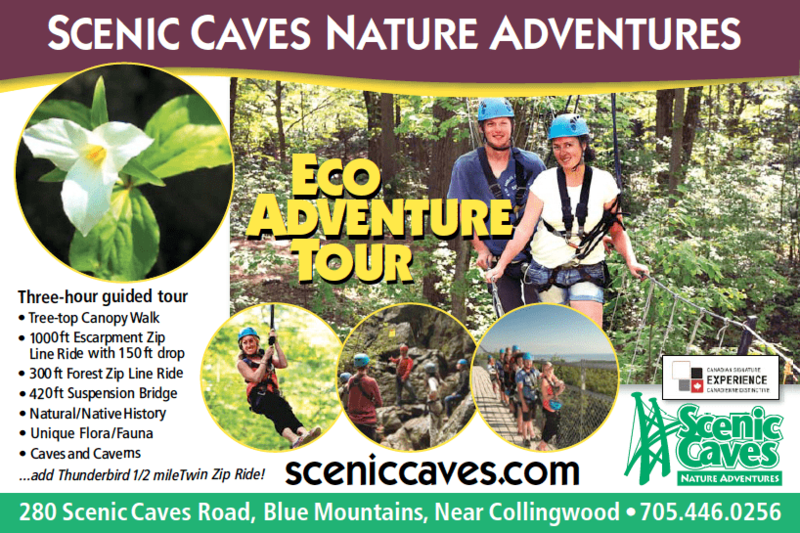 Glide a 300 ft. forest zip line down to the caves & caverns to discover secret hiding places and hear about the legends of the First Nation’s Petun tribe. The grand finale is a 1000 ft. escarpment zip ride where you drop a dizzying forty-eight meters from cliff top to earth. Our goal is to inspire environmental stewardship and team-work by connecting young people with their natural environment.